The new sanctuary at the church in Des Moines, Iowa was inspired by the spirit and architecture of the original basilica church in Assisi, Italy. It features an octagonal worship center and seats 1,000 worshippers in eleven rows of pews surrounding a central raised altar platform. Behind the altar is seating for a 60-person choir and space for instruments. Auerbach Glasow provided architectural lighting design and custom pendant design for the sanctuary, gathering space and chapel. 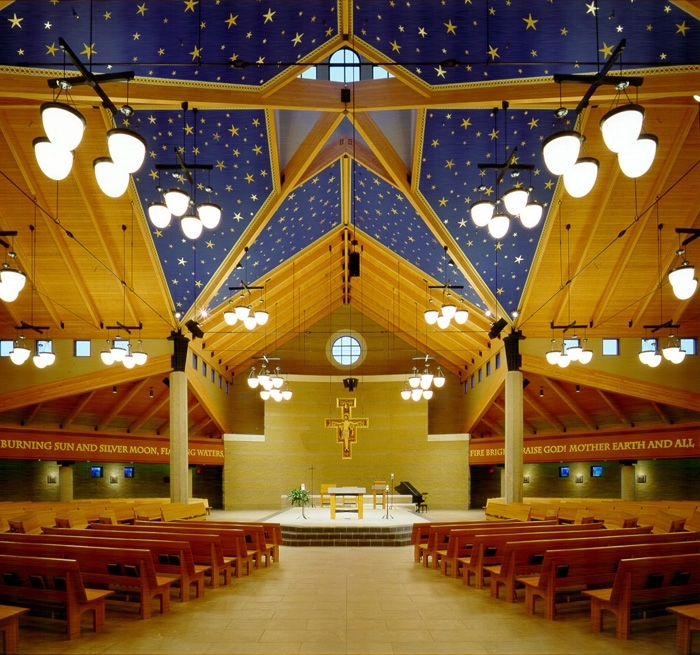 The custom pendants both illuminate the congregation and uplight the decorative ceiling. Downlights and adjustable spotlights highlight the chancel and choir to support the diverse program of worship and activities.